Good morning! Our tutorial today is a sweet, flirty style that we came up with while playing around with one of our extra long, skinny scarves. We also like the way this one looks when you roll the braid up into a side-bun – play around with it, and see what you like best! If you give it a try, we’d love it if you’d share it with us. 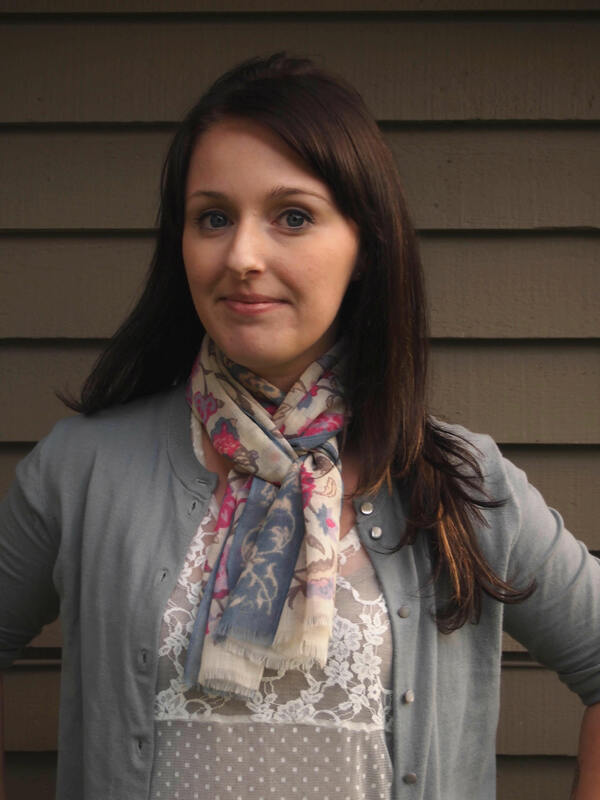 Start with a long rectangle scarf (or a large square scarf, folded into a skinny rectangle). Gather hair to one side. Wrap scarf over your head, and make a knot behind one ear, leaving one end as long as possible. Tuck the short end of the knot so that it won’t be visible. 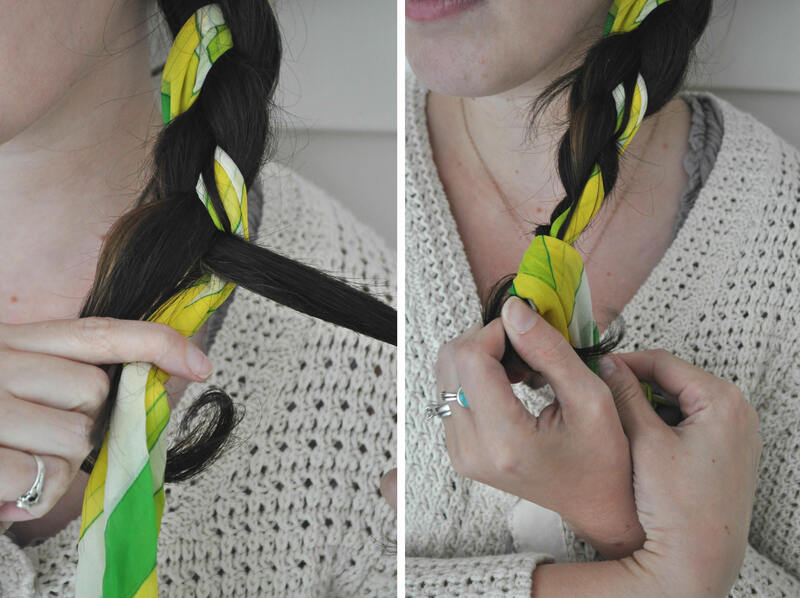 Separate hair into two sections, then braid the hair and scarf together. 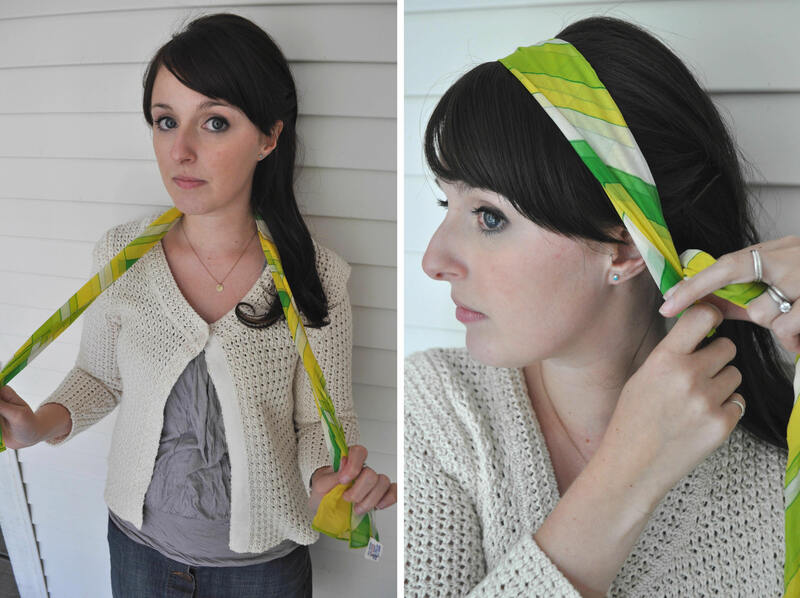 You may secure tightly with a hairband, and then wrap the end of the scarf over the hairband to cover it. 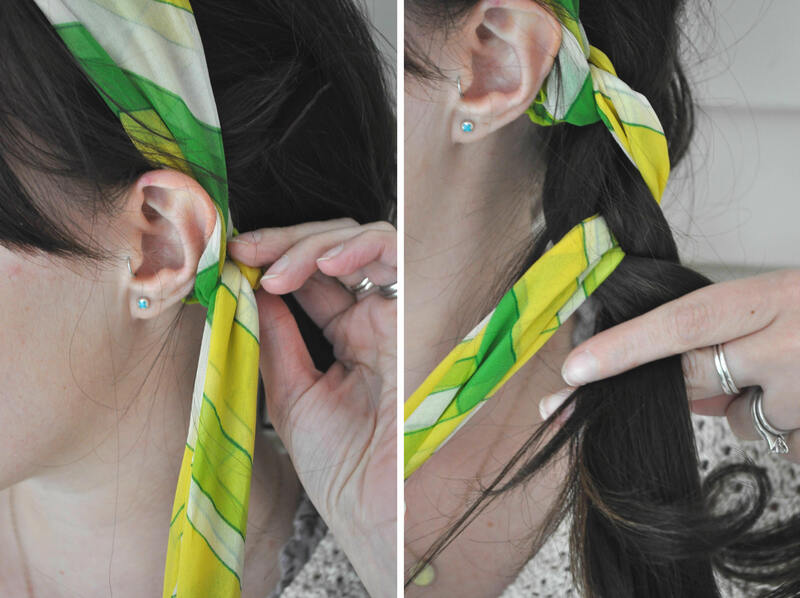 We used our “Suzie” scarf for this how-to – a rayon chiffon scarf from the 1960’s. If you want it for your very own, you can see it in our store. Hello again! 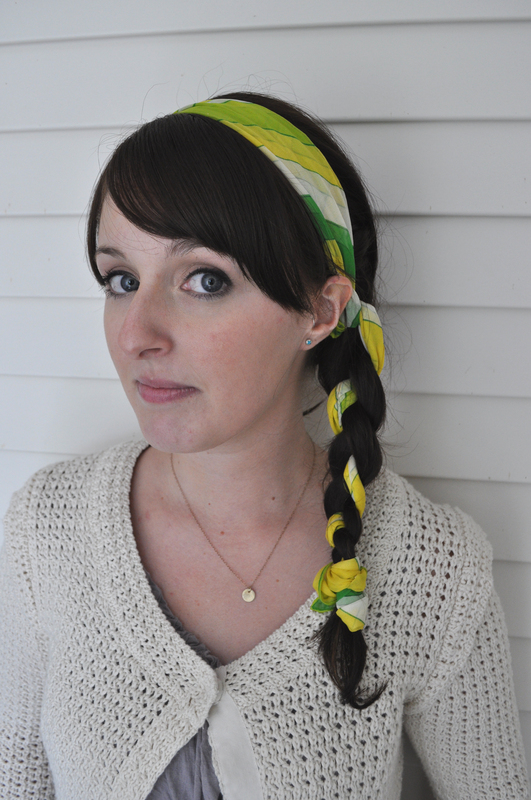 We’re back for our third tutorial, and this time we’re showing you how to do something fun with a much smaller scarf. There are plenty of very small scarves out there that are beautiful, but aren’t as versatile to wear as a larger scarf that can be tied into dozens of styles. The one we’re using for our how-to today is a big favorite of ours (how cute is this heart print?! ), and we’re happy to inspire you with one way to show it off. This Fleur de Lis fold is actually a napkin folding technique, but we think it makes a cute and playfold fold for a pocket square! Tuck it in your jacket pocket for a traditional look, or let it hang out of the back pocket of your jeans for an unexpected pop of personality. …and then fold the top of it back down. Grab the right side and tuck it under the whole scarf, rolling it in half to fit neatly in the middle of the back. Then fold the left side all the way around (making a little burrito! ), and tuck the corner under the fold in the middle front to secure it. Fluff out the points at the top, et voila! A perfect Fleur de Lis for tucking wherever you like! Sure, you could just cram the whole scarf in your pocket, and foof out the ends to get a similar effect, but with the Fleur de Lis fold it will stay neat and tidy all day! 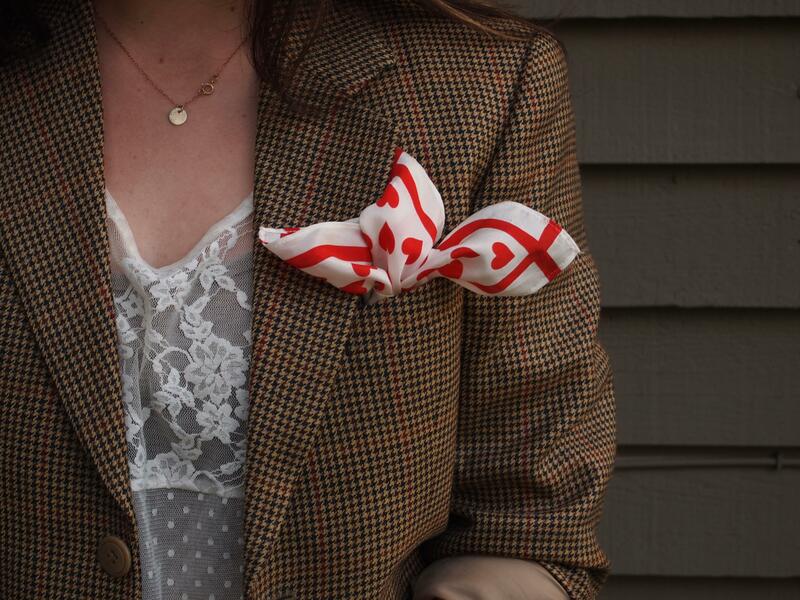 If you love this little Valentine scarf please check it out in our shop – we just added it today! Scarf Week, and our first tutorial! 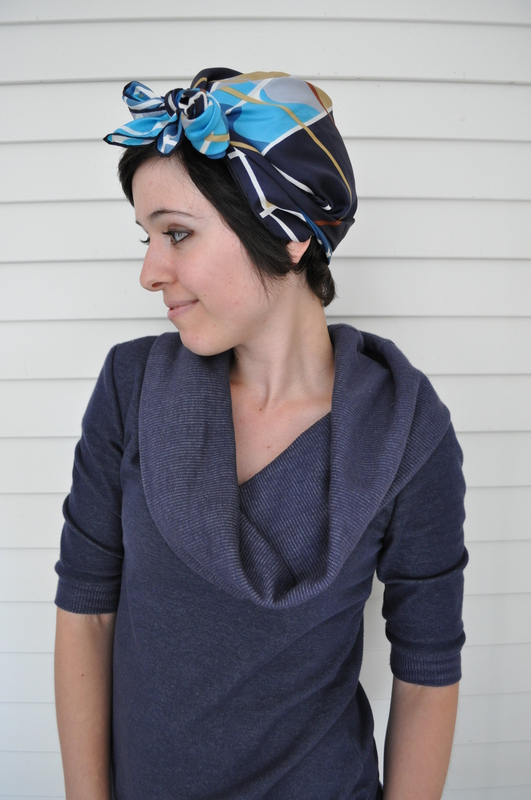 At Lise + Katina we have deemed this week to be… Scarf Week! We will be adding a different vintage scarf to our shop every day this week, and we have some blogging to do that we are really excited to show you! Our first thought was to fill our blog with pictures of sharks with scarves ‘shopped onto them (Because, you know… Shark Week? Scarf Week? Well at least we crack ourselves up…), but honestly neither of us is that good with photo editing, so you’ll have to settle for our second choice – scarf-tying tutorials! 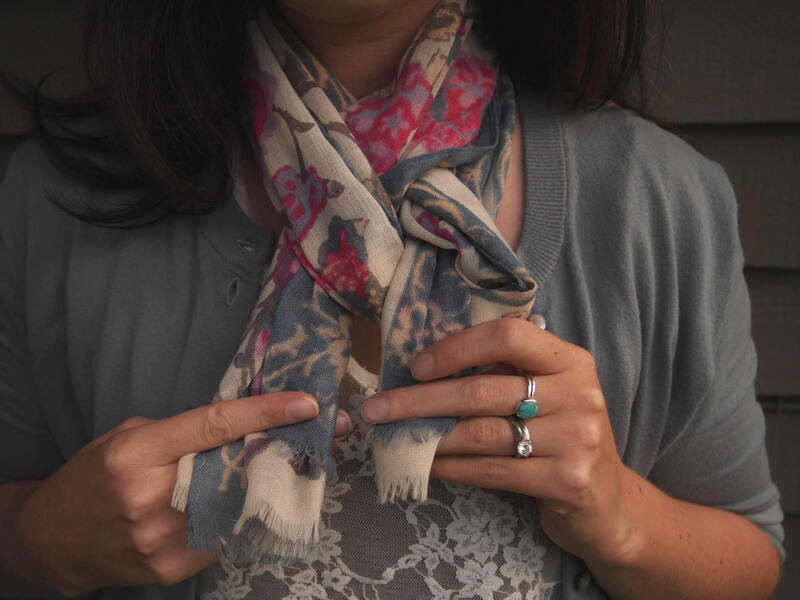 We picked some of our favorite ways to wear our own vintage scarves, and we will be posting how-to’s along with the listing of the day. Let’s start it off with something simple – a casual look that is easy to do, but appears polished. 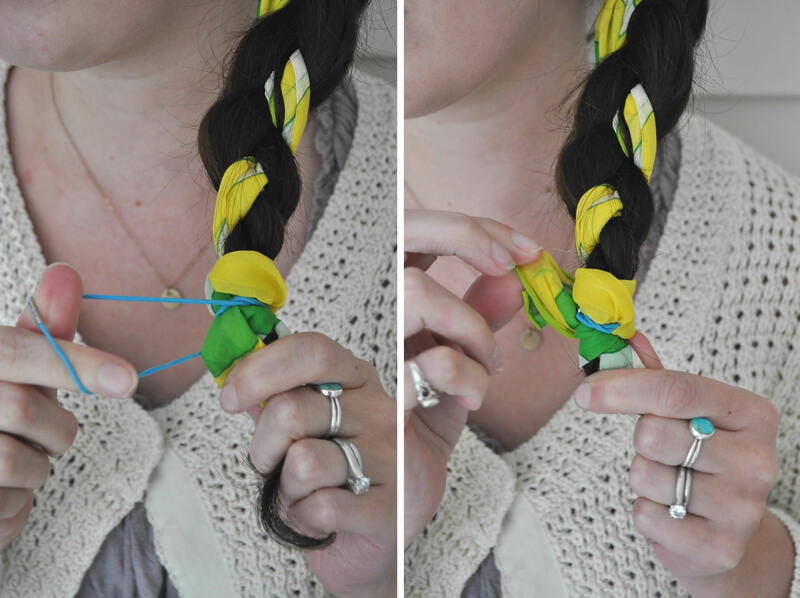 This trick works best with a long rectangle scarf (ideal for winter scarves too! ), but you can also do it with a large square scarf – just fold it over into a triangle, and then fold it over on itself two more times to make it long and skinny. 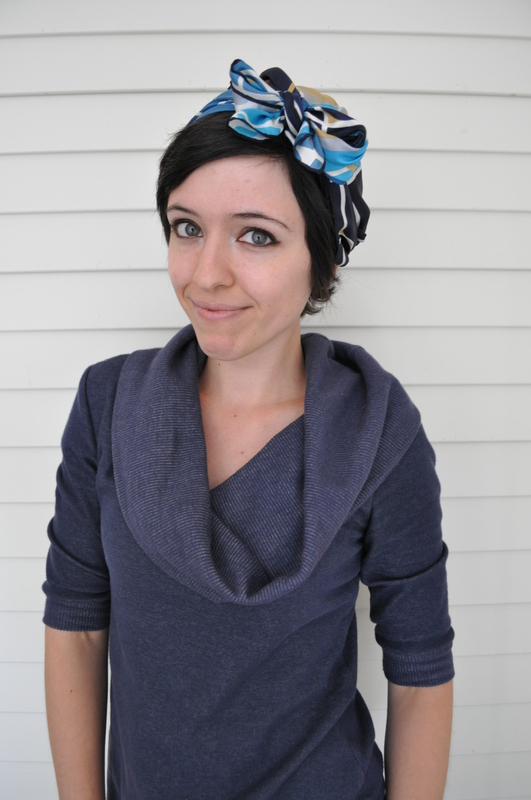 Fold scarf in half, and put it around your neck with a loop on one side, and two ends on the other. 2. Put one of the ends through the loop, going over the edge of the loop that is closest to you, and under the edge farthest away. With the other end, this time go under the edge closest to you, and over the edge farthest away. Ta da! Effortless and adorable! The scarf we chose for this look is our vintage ‘Fleur’ scarf by Vera – a rare, light, summer wool in earth tones with a pop of hot pink. We just put it in our shop this morning, so go have a look! As you know, our Etsy shop went live yesterday. Today we’d like to talk a little bit more about two of our favorite items! 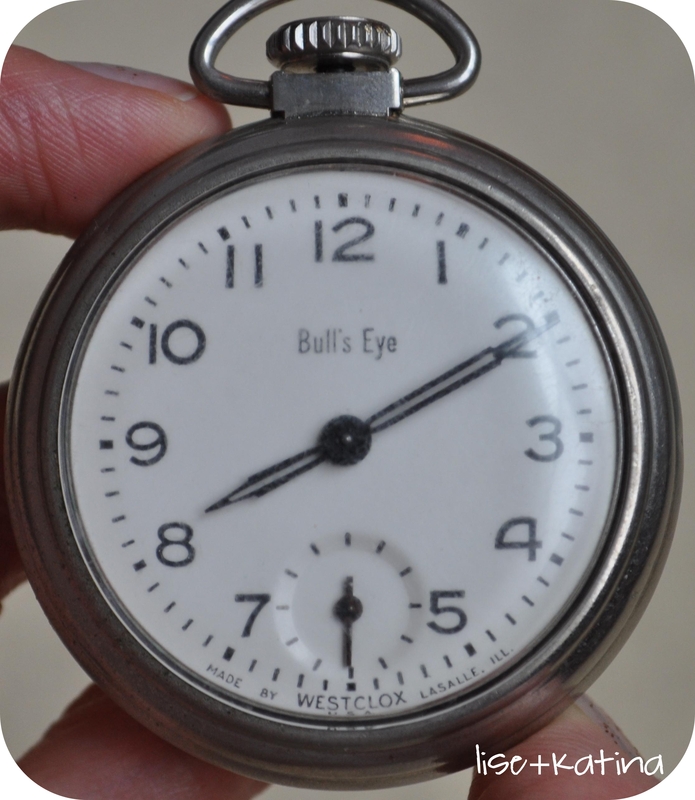 We are featuring two pocket watches from the 1950’s: a Westclox “Dax” and a Westclox “Bull’s Eye”. Watches like these were made throughout the 20th century as “dollar watches” – watches that were so cheap that anyone could afford one. These two are both nickel plated, with plastic crystals and metal faces; both with snap backs and pendant style loops. They are both mechanical, and work quite well! 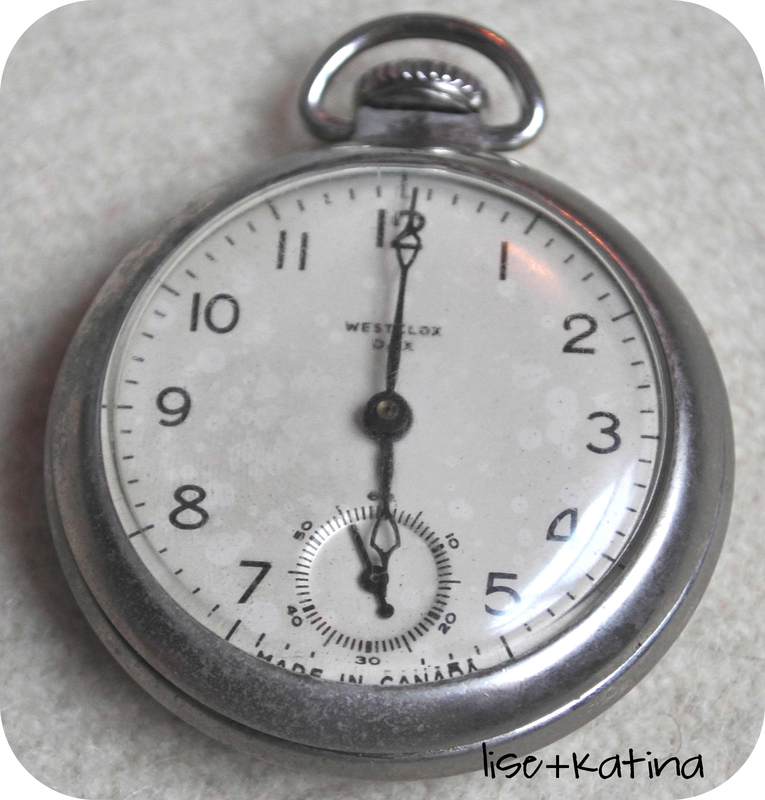 Vintage pocket watches are very popular lately with collectors and crafters alike, and it’s easy to see why – with even the cheapest models there is a certain charm and character that modern watches just don’t have. Many people collect these for display, or for parts. However, we always love to wear our vintage finds! 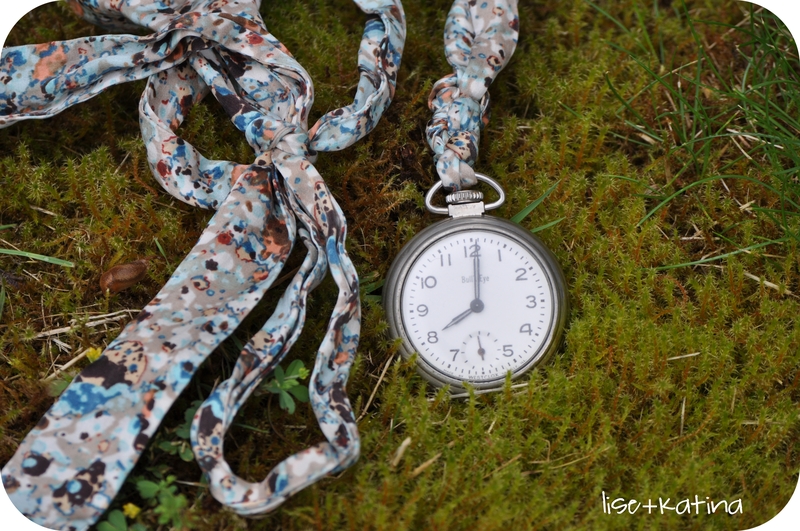 Certainly these would look great strung on a chain as intended, but right now we are obsessed with the contrast between a classic metal watch, and a fun or funky ribbon necklace! 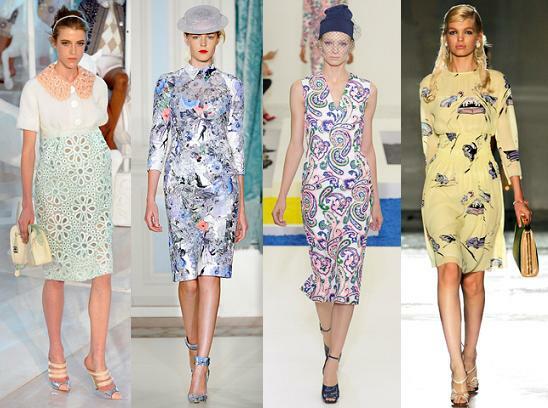 For this style we used a thin, silk scarf belt, but you could create any combination of looks from different thicknesses and patterns of ribbons and scarves. 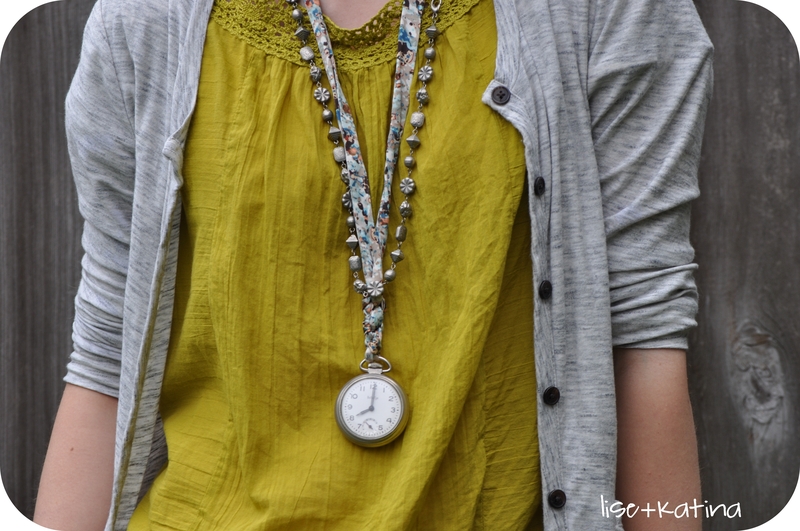 Layering with other silver-toned necklaces finishes off the look (We used a vintage nickle-plated beaded chain). If you give it a try, please send us your pictures! We would LOVE to see how you style it!